the first album of our massive fall/winter release lineup is finally out! Jfrank from the Brainstormlab collective opens up the party with his brilliant "More Awkward Breaks by Jfrank" album - a selection of 12 tracks taken from his livesets. Go check the release page or download the full album now and show some love! Go to youtube to check the rest, it's well worth it! 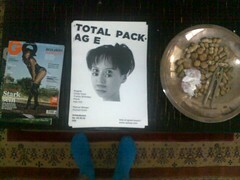 By the way, ♥ thanks ♥ to everyone who joined us at the "Total Package" night last Saturday in Stuttgart, it was a great party. Here are some pictures, thanks to Tilman of Cindy Sizer!